Before we get into the calculations of safety stock we need to understand on why do we need safety stock? The need for safety stock is primarily to cater to the variations in supply and demand. If there was no uncertainty in demand or supply then there would be no need in safety stock. Since we are dealing with uncertainty and variation the obvious way to calculate safety stock would be using the standard deviation for the variation in demand and supply. 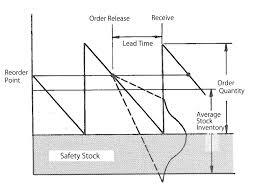 The other important concept that need to be understood while calculating safety stock is the service level. Service level is the percentage of demand that needs to be met from the on hand inventory level. Service level: It is measured in two ways. Fill Rate and Probability of Stock Out. Fill Rate: If there were 3 orders in a week. Each order was of 100 units, which means the total demand was 300 units. The first and the second order was met in full while the last order only 20 units could be supplied then the fill rate would be 210/300 = 70%. The other factors that need to be considered are Lead Time, Forecast and Forecast Period, Order Cycle, Reorder point, Lead Time Demand etc. Safety stock formulas are often changed based on individual customer requirements.